Dinner under the stars against the backdrop of sacred indigenous site Uluru is offered in the outback of Australia’s Northern Territory with Sounds of Silence. Travelling foodies can nibble on morsels of crocodile, washed down with sparkling wine, while being serenaded by didgeridoo, overlooking the Uluru-Kata Tjuta National Park. After a bush tucker-inspired buffet, it all goes eerily quiet and eyes turn upwards to gaze at the heavens as the mysteries of the starry night skies are decoded by the resident astrologist. 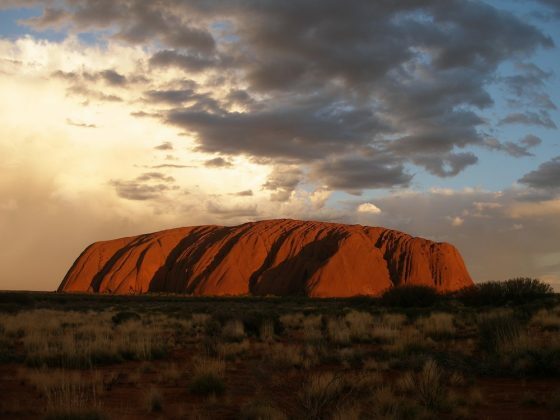 A sandstone rock formation, Uluru is a sacred indigenous site in the outback of Australia’s Norther Territory.